I decorated with pearls (tears) and played with a new wave front pattern over the sea on the base chiffon. 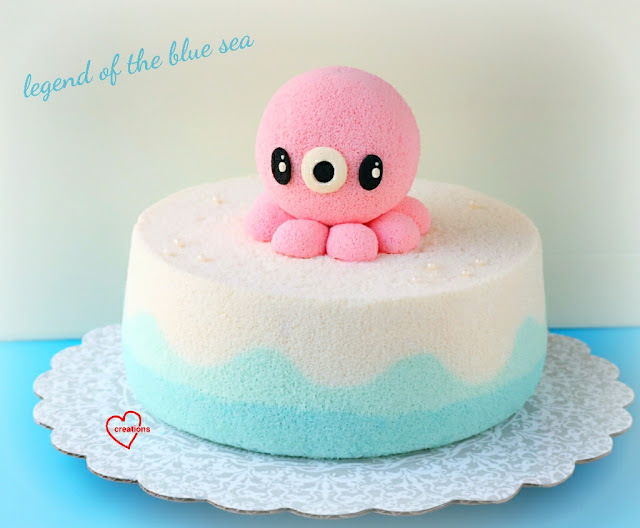 For those interested in making a chiffon cake octopus, you can refer to my previous post Kaya chiffon cake with Yam chiffon baby octopus. I have also shared various kind of seawaves chiffon patterns in Deco Chiffon Cakes and Creative baking: Chiffon Cakes. I didn't make the cake for myself of course though I like the show very much. It's made for a friend who's a LOTBS fan =).